As I scrolled through Instagram, I began to see a project take shape, literally from the ground up. Adobes bricked formed a curved wall that stepped upward toward the apex. Joanna Keane Lopez painted the the brown adobe with whitewash made of lime on the concave side. The convex side was left it’s natural adobe color. There, two small buttresses shared the weight of the wall. It an interesting time for adobe. 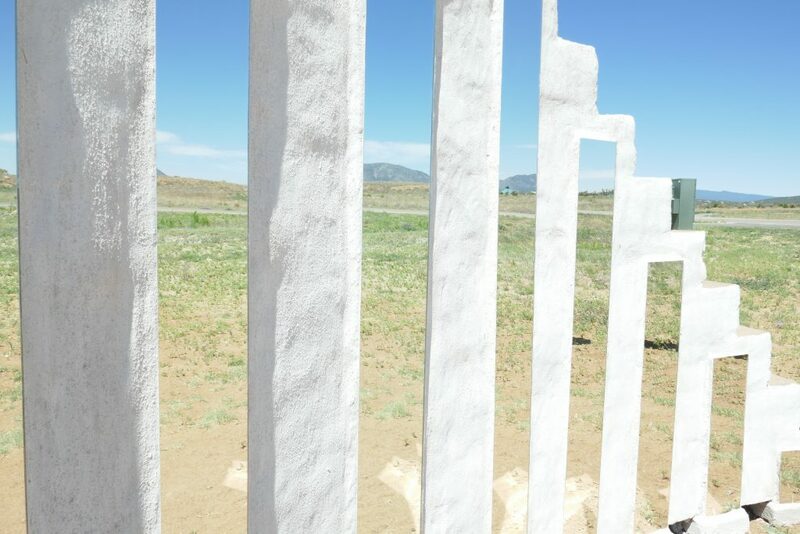 When I saw Joanna’s work, I had been thinking deeply about the adobe production of Rafa Esparza, especially his installation Figure/Ground: Beyond the White Field at the Whitney Biennial (see previous 2 posts) where he also built an adobe wall, but this time in the white cube. He introduced brown matter into that space, overtook it really. To use adobe is to call forth a certain materiality, to emphasize the grittiness of matter (mud, hay, dung), and the labor needed to turn the formless into a structure. I had this in mind when I saw Joanna’s structure slowly go up. Over the course of a few days, she posted pictures of her progress. 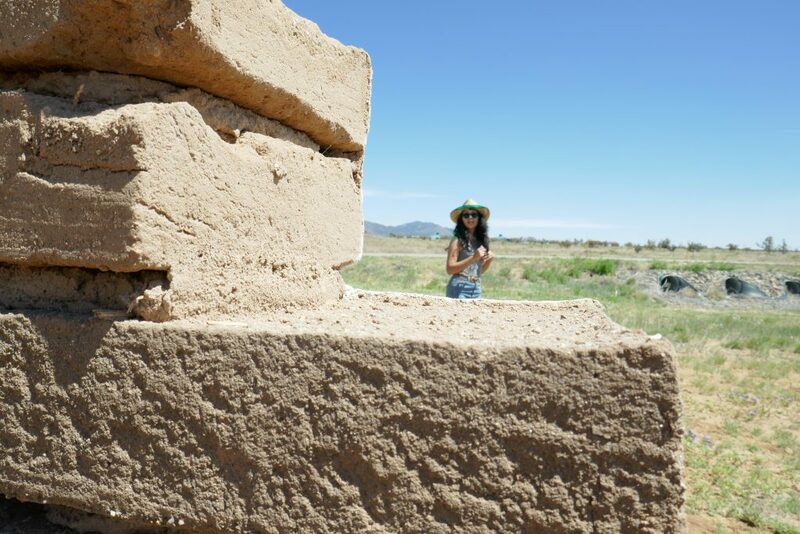 In the end, thin mirrors ran vertically down the adobe walls’ stepped facade. If you only glanced, you might think they were windows offering a sliver of a view of what lay beyond the wall’s other side. The view was that clear. The mirrors actually reflected the slate blue of the Sandia Mountains. Standing in front of the structure and facing the mirrors meant that the mountains would be behind you. You could see yourself amongst them. 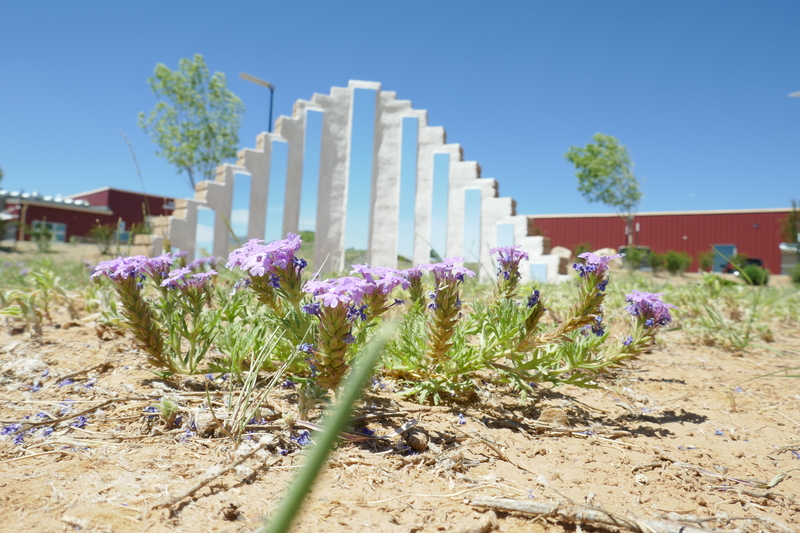 Each year, New Mexico Arts partners with a local community to commission up to ten temporary, visually engaging, and conceptually rich environmental artworks to be displayed for a short term exhibition in that community. Joanna’s proposal was one of five selected for placement in Edgewood. Their theme this year was persistence. I drove from Santa Fe to Edgewood, through the Galisteo Basin, a vast expanse of lowland that opens into ranchlands, to see the work for myself before entropy set in. The artist, who I met at the University of New Mexico when she was a student of the Land Arts program, spoke about learning how to create the mortar needed to seal the bricks together—the mortar came from the site itself and hay was scattered about where she mixed it—the weight of the total sculpture, working with her hands, growing up with roots in the town of Socorro, and moving to LA. The whole time we stood in front of the sculpture. I could the myself reflected in the landscape, the mountains a silhouette behind me, a crisp blue sky taking up a majority of the horizon. From certain angles, the landscape even appeared to double back on itself as behind became in front and in front behind. Persist, Repeat, Reflect. Alicia Inez Guzmán: Tell me about your art background. How did you first begin making and using adobes in your work? Joanna Keane Lopez: I was originally inspired to work with adobe from apprenticing with well-known women artists in Taos, New Mexico — Carole Crews and Anita Rodríguez. Both are traditional builders who have constructed their own adobe homes. From Carole and Anita, I learned the art of the enjarradora “woman plasterer” who works with aliz, a traditional clay slip. I also learned how to re-plaster, repair cracks and water damage of old adobe homes. From my experience with these skilled artisans, I felt confident and supported to continue working with the material of mud. Soon afterwards, I began working on my honors thesis, Oda a la fuente, for my BFA degree at the University of New Mexico. I wanted to work with adobe and I found this craigslist ad for free adobe bricks in Old Town Albuquerque and went to meet the guy. It was his grandparents adobe home that was now crumbling to the ground. I collected the 100+ years old bricks, broke them down with a mallet, added fresh straw and water, poured them into wooden frames I made and reconstructed the adobes anew. I remember being amazed as I processed them. I found old bits of newspaper from another time and ancient looking rolling paper ads dried into the ancient brown mud. It felt magical and a little bit like I was an archeologist… uncovering the past, something forgotten that was hand built by another nuevo mexicano long ago and finding myself repurposing the material again. It was like I was discovering ghosts and continuing a story. For the installation, Oda a la fuente, I made four 6’x5’x5’ house-like paper structures made of natural materials of the local environment, such as natural dyes and aliz clay plaster. 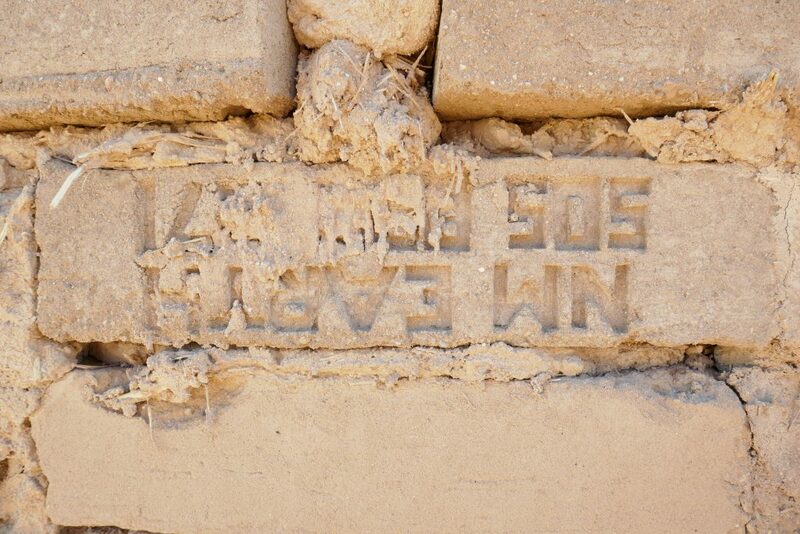 I used the adobe bricks I was given, broke down and remade as a foundation for one of the homes. AIG: What enticed you to use the material for your T.I.M.E. project: Persist Repeat Reflect? And what kind of labor did that work entail? And how does it feel to be an adobera? JKL: There was no doubt in my mind that I wanted to work with adobe for New Mexico Art’s Temporary Installations Made for the Environment in Edgewood this year. I enjoy building large installations and making work that explores adobe architecture. My future interest is building and constructing experimental adobe houses. Persist, Repeat, Reflect is one evolving start of that desire. Building the TIME sculptural installation was labor intensive. 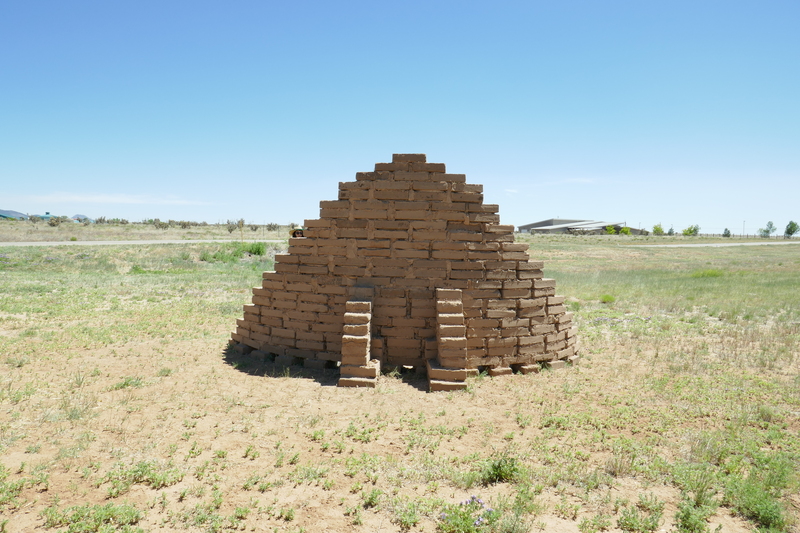 The adobe bricks weigh 30 pounds each and we ended up hauling 3 tons of adobe to Edgewood, about 30 miles from Albuquerque to construct the installation. It then took three days to create the adobe structure. The next step was installing the mirrors, plastering the remaining surface area, and then whitewashing the front wall with lime. Building large with adobe is definitely a collaborative effort. I’d like to thank José Vergara, Matt Adams, Michael Lopez and my mom, Colleen for helping me out at various parts along the way. As for being an adobera… it makes me want to focus more on not just being an artist, but an artist-builder. AIG: What’s the significance of the title? Is it about the material, the labor, or the reception of the work? Or is it about a broader politics? JKL: The title of the installation, Persist, Repeat, Reflect refers to a person’s interaction with the landscape. I tried to capture the feeling of persistence with the repeating rhythm of reflection and escalation of adobe brick forms. Also, the term “persistence” was the theme this year for T.I.M.E. In other ways the title refers to the material of adobe — it’s so old and theres something magical and simplistic about the art form. I think it’s an important traditional New Mexican practice to continue. AIG: How does this project relate to your broader oeuvre? (the zines, the papermaking, etc.) Do you see this is a kind of land-based art? Is that important to you? My work revolves around land-based art. The zine I made, Plantcraft: Medicinal Botanicals of New Mexico and the papermaking are both environmentally sourced as are many of my other projects. Land-based materials, methods and concepts are important to me because they are intrinsically engaged in a relationship with the environment, while being rooted in history, culture and functionality. AIG: It seems like growing up in New Mexico has inspired your work. What about your upbringing, your cultural roots, or your proximity to the land/landscape stood out for you? JKL: I was born and raised in Albuquerque, New Mexico. My father’s family, the Lopez’s, are all from Socorro, a small dusty town in the central-southern part of the state. Our family has an old Spanish land grant out there near the New Mexico Technical College. Much of it is in ruins and disarray now. A lot of the family is gone as well after my grandmother, Adelina died a few years ago. Although, one structure has remained well intact, my father’s adobe home. It was built by my great grandparents. I feel a strong attachment to this house… I think because it represents something that has withstood time and has had generations of family members take care of it and build onto it. I feel like my work takes on this quality of being an echo, a ghost, a memory of land-based lifestyles, something lost and fragmented and reaching to recover it, reconnect or find some kind of inkling of continuity. Working with plants and the land is something that has been passed down to me through both sides of my family, a kind of intergenerational memory. My great-grandmother on my mom’s side was an herbalist in Ireland. My grandfather on my New Mexican side worked with medicinal plants as well as being the mayordomo, the overseer of the local acequias in Socorro, New Mexico. AIG: The term “southwest” means a lot of different things to a lot of different people. What does it mean to you and your art? JKL: For me, the Southwest is a place that is rooted to my sense of self. I’m reminded of the desert, prickly things, mountains, hidden creeks, piñon trees, dry heat, coyotes, vast spaces and big skies. The Southwest is intricately related with the cultural influence of Mexico, Mexican-American history and immigration and of course the original indigenous people, the Diné, the Pueblo Indians, the Apaches, Utes, and many more. The Southwest is also a place that has been exploited for its metals and minerals such as uranium and turquoise. It’s a beautiful and ancient place that has also been scarred through mining, nuclear detonations and radioactive happenings. I’m awed by the landscape of the Southwest from Utah to Texas, but I’m definitely partial to New Mexico because that is where my family is from, where my mom has lived for over forty years, where I grew up and where I feel like I’m a part of the story. With my art, I’m inspired by practices that have developed out of a relationship with land. Examples specific to the Southwest include the enjarradora “traditional woman plasterer” who works with mud and adobe architecture, the tejedora “woman weaver” who works with wool obtained from sheep and dyes made from plants and insects and the curandera “medicine woman” who utilizes regional medicinal botanicals to heal. AIG: What are you currently working on? JKL: Currently, I’m applying for residencies and various grants. In October, I’ve been commissioned to build a site-specific art installation for the Desert Daze music festival in Joshua Tree, California. In the future, my focus is to continue building sculptural installations and public art projects that address land-based materials and concepts. Very fine article. The work itself is very cool!